Original 1861-1865 Wood Engravings From "Punch, or the London Charivari"
All of the prints in this section were published in England during the Civil War and most of them are classic caricatures of Abraham Lincoln. 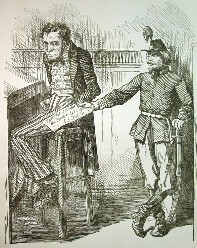 Punch was widely read in America and many of the images were copied not only during the Civil War but many years thereafter and applied to different uses. 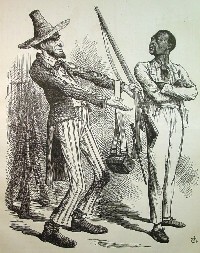 England was very interested in the outcome of the American Civil War for a variety of reasons, it felt parentage of the United States; it had considerable trade relations with the United States, including a large trade in Southern cotton; the United States was a significant military and economic power; and the moral and economic issue of slavery was important because the British had abolished slavery. Most of the engravings offered below include caricatures of President Abraham Lincoln who is pictured as a lanky "Brother Jonathan" or Uncle Sam like character. 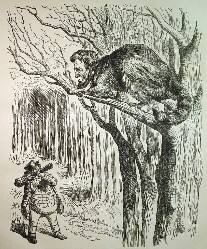 All these original wood engravings appeared in the famous Punch magazine from 1861 through 1865. Most were drawn by the chief cartoonist of Punch, Sir John Tenniel. 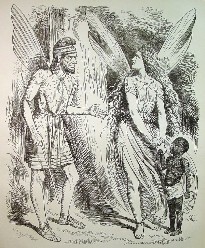 Punch institutionalized the editorial cartoon that survives to this day. 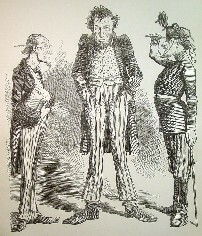 With the brilliant pencil of John Tenniel, later Sir John, a cartoonist for half a century; with the skill of his engraver, Joseph Swain; and with the wit of the inner circle who occupied the famed Punch table and decided the contents of each week's cartoon, the magazine became something of a British institution. During the American Civil War, Tenniel and company sparkled. And they paid a great deal of attention to the events overseas even though at first they largely ignored Lincoln. 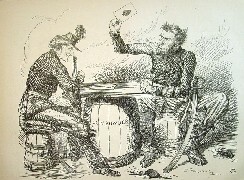 From the time he first appeared in the May 1861 issue to his last appearance almost exactly four years later, more than 20 percent of Punch's weekly cartoons focused in whole or in part on the American war. Except for one engraving on the August 1863 New York draft riots all the prints are dated on the engraving. Unlike most magazine engravings, these full page engravings are blank on the reverse, not filled with text that may show through. 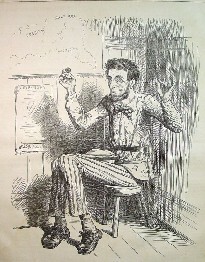 The Lincoln caricatures come with a description of the background and significance of the print from Lincoln in Caricature by Rufus Rockwell Wilson. Some of the prints also include relevant text from Punch that came from the issue in which the print was included. Each of the prints is 8 x 10 1/2 inches and comes already matted to a standard frame size of 11 x 14 inches. The prints are uniformly age toned as you would expect from paper that is over 140 years old. The matted print are protected in a clear plastic wrap and are ready to frame or keep as is. Insured shipping with delivery confirmation is $10 for these prints, with no additional charges for more than one print (contact us for multiple print purchases if paying with PayPal or we will promptly send you a refund on the excess shipping charge). Below are the Lincoln prints from Punch in our inventory in chronological order followed by other interesting Civil War era prints from Punch dealing with the critical conflict and slavery. This page shows prints published in 1862, the second page has prints published in 1863, the third page has prints published in 1864 and 1865 and last page has the Civil War Punch prints without Lincoln caricatures. Click on the title of the print or picture to get larger pictures, descriptions, prices and/or to order. "ABE LINCOLN'S LAST CARD; OR, ROUGE-ET-NOIR"